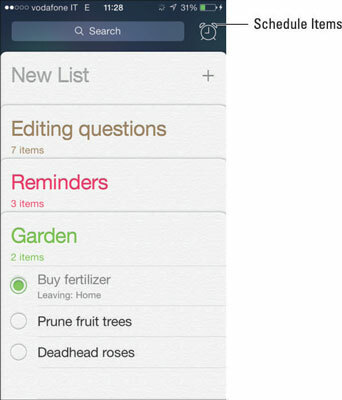 The Reminders feature is an iPhone catch-all for your To Do lists, neatly divided into categories you establish. Create lists of tasks and then have Reminders send you an alert based on a time or location. So you never forget a task regardless of the device you have at hand, Reminders automatically syncs via iCloud with the Reminders app on your other iOS devices or Mac and with Outlook on your Mac or Windows PC. Just remember to turn Reminders on in Settings→iCloud. Tap Reminders on the Home screen to open Reminders. Tap New List at the top of the screen. A New List appears with the keyboard at the bottom of the screen. If you see an open reminder, tap the white strip at the bottom of the screen to open the list of reminders and the New List option. Type a title for your new list. Tap the color you want the list to be. Reorder your lists by touching and dragging them up and down the screen until they are displayed in the order you like. Rename the list: Tap and hold to select the name and then type a new one. Change the list color: Tap Color and choose a new hue. Delete the list: Tap Delete List at the bottom of the screen. Search in Reminders by tapping the Search field. Type a few words of the task you’re looking for in the search field or use Spotlight Search from the Home screen. Or just ask Siri to find a reminder for you. To see a list of your scheduled tasks, tap the alarm clock to the right of the Search field. If you don’t see the search field and alarm clock, pull down lightly on the stack of lists. Likewise, push up to hide it.